I still prefer a paper book, but I might consider diving into the digital word a bit more with Calibre. It helps you manage your e-book collection and convert them to popular mobile formats. 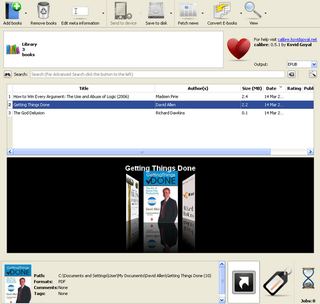 Calibre features a Cover Flow-esque browsing feature, tagging system, spaces for comments and EPUB, PRF and MOBI file conversion for over thirteen document formats. That means your e-books will be compatible with popular readers like the SONY PRS 500/505/700, Cybook Gen 3, Amazon Kindle (1 and 2) and the iPhone (with the Stanza reader software). You can also convert RSS feeds into your format of choice for easy reading. There is even a built-in web server that allows for remote access.